This charcoal portrait commission was picked up at the gallery on Saturday morning. As much as I like the pay, the satisfaction I get when I see the look on a client's face is priceless to me. This was the client's grandfather, and she was very pleased. I was very pleased that she was happy. I absolutely love being an artist! I became a grandmother this year and decided it was time to end my partnership with Lady Clairol. She and I have been intimate friends since I was 33 years old. Women in my family gray prematurely. And so, I am finally posting an updated picture of myself on this blog. Oh Well, I don't have to be gorgeous, I am talented! I apologize for the duplicate image of this young reenactor. I am still trying to get the hang of my new laptop. Anyway, you will remember that a few posts back I had a great photo opportunity and got some incredible photos of some civil war reenactors. This little boy was there with his dad and he was so proud to tell me that he had actually fired his dad's musket and he was even more proud to tell me how his dad had taught him about gun safety and how to shoot the musket. When he climbed up onto the fence, I knew I had to do a painting of him one day. So here goes.....I started the drawing this afternoon, after working on another drawing of the same reenactores in a different scene. Before I show you that one, I need to make some adjustments to it. Tip: When you think something is wrong with your drawing, photograph it and print it out. It's amazing the errors I find in my work when I do this. I already see two areas on this little boy, that I will change tomorrow. Oh, it was 100 degrees again this morning when I arrived at the gallery. It's official. Three people have now seen my little female hummingbird with the string wrapped around her leg, at our feeder again this year. I posted a photo of her last year and will try to get a photo of her this year. This year her piece of string looks shorter and looks like it may be wrapped more around her leg. I think it is amazing that she has survived five years with such a handicap. In the future I promise to post art related information more often!!!! What can I say, I love nature. I ran both air conditioners all day today. My little building dates to the mid 1800's and has no insulation, just clap boards. The sun beats down on the large front window as soon as the sun rises and it was 100 degrees when I arrived at 9:30 this morning. Even so, my day was great. I almost finished the charcoal portrait I started this morning. It is on a 16 x 20 piece of blue Canson pastel paper. 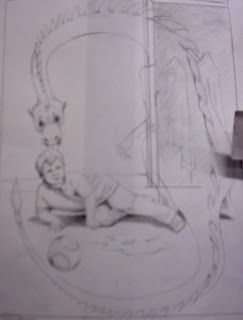 I am very happy with what has been done already and am looking forward to starting my illustration for my portfolio. OK, time does not exist for the artist. Well, this one anyway. Already a week and no post. Thus the Journal title, Monthly Masterpiece. So to catch up, I finally had a decent week at the gallery/studio. Started a floral painting based on a beautiful study I did recently. Worked hard on it and after three days work, I abandoned it. As Charlton Heston said, "When the wine is bad, through it out". That was a line from The Agony and The Ecstasy where he played Michelangelo. I restarted it on Sunday and now love it, love it, love it. I have been thinking and thinking and thinking, and drawing, drawing, drawing, illustration ideas since returning from the Illustration Master Class. Spent this morning starting an oil painting of water lilies and this afternoon researching my subject for my first illustration for my illustration portfolio. I am going to try the working method of Donato Giancola, which I saw him demonstrate at the IMC. I begin the drawing tomorrow. 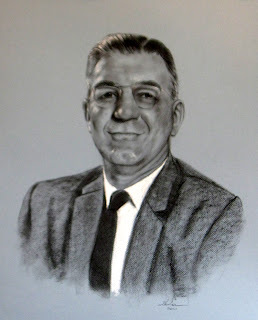 I received a commission to do a portrait in charcoal, posthumously. I start that tomorrow also. I even made my rent for this month. Not a bad weekend, eh? Now if this momentum will just keep going! Oh and my plantar faciaitis is now almost totally healed. YEAH!!!!! 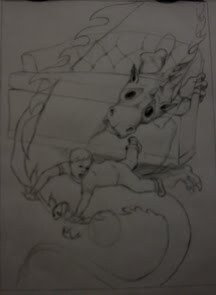 This is the finished illustration for the cover of the children's book, "The Trouble With Invisible Dragons". I have already written a short childrens' story and will continue to do illustrations for the book this year. Once I have a dummy ready, I will shop it around to publishers. This is a little dark, but I did that so you could at least see it. Anyone who can enlighten me as to how to photograph drawings so they come out well, please e-mail me at sha45rps@starpower.net. Ok, this is my revised work for the Invisible Dragon coverart. I almost have the color final ready and will post it as soon as I have it finished. OMG! My son liked Medusa......this is the highest form of praise for me. He also thought my Boris Vallejo autograph was cool. 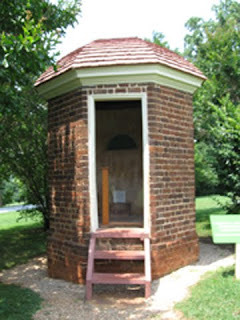 History is everywhere in Virginia and my husband and I have a passion for American History. We visit a few historical sites each summer and last week we drove down to the Lynchburg area to see Poplar Forest. This was Thomas Jefferson's other home, the one he retreated to when he needed to detox and get away from the bustle of society. He actually moved his wife and family there when the British invaded and came looking for the "Traitor Jefferson" at Monticello. These two photos show you his privy. As you can see the man loved octagons. His house at Poplar Forest is also an octagon. 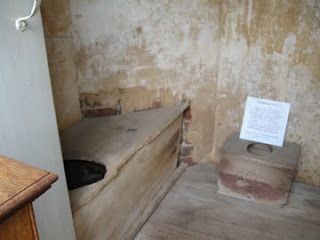 I was told that the board seat in the privy is the very original that Mr. Jefferson placed his own bums on. This really made him more human than hero to me. Also, how adorable that he even had a childs potty installed. In later years, his granddaughters spent a lot of time with him at Poplar Forest. I hope you all have a rebelous 4th of July. Make some noise in memory of Mr. Jefferson and all the heros of our Revolution. Here is the chunk of Medusa's arm falling away which I added as an afterthought. I am still not too sure about the crack in her face. I will consider it again in a few days, with fresh eyes. I worked all day yesterday on Medusa, adding cracks and pitting to make her look like stone. I was so happy to finally have her finished. When I returned to the studio this morning and walked in I immediately disliked what I had done the day before. A fresh eye will always reveal a mistake. So I spent this day, removing or redoing the cracks and pitting. Finally, I decided to add a chunk of her stone arm, falling away.